Examining Travel Trends is a fascinating exercise. Gleaning nuggets of wisdom is often fun to do. As I travel a far amount – I am not likely to be your typical traveller. However there are trends that support what one can intuitively feel. For some time I have been watching the decline of the domestic market travellers. On face value this trend was driven in most part by the high cost of fuel. In general many believe that the high cost of both gasoline and aviation fuel have slowed growth of domestic travel (both leisure and business). However there are other trends which are fueling the decline in growth. 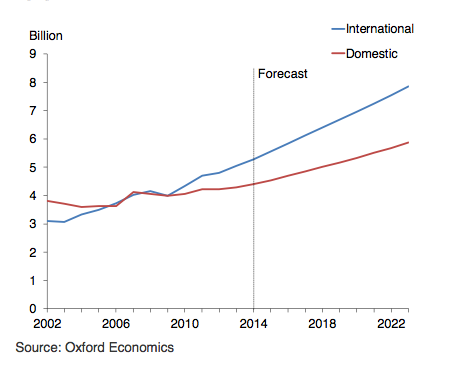 The following chart shows the disparity between domestic and international growth rates in accommodation 2002-2023. (From the Oxford Economics/Amadeus Travel Trends 2014. http://blogamadeus.com/wp-content/uploads/2014/04/AmadeusTravelTrends.pdf). Hassle factor – short haul traffic is not fun. In all regions of the world the ability to travel at all has created a barrier to entry that just makes short haul travel – well not nice. Technology reduces the need. Desktop communications such as Skype and Join.Me has dramatically reduced the need for direct face to face travel in total but particularly for short haul. Desktop small meetings have also reduced the need for these to take place. This may seem counter intuitive to the need for increased meetings (yes you know what I mean). Yes men can actually multi-task. We have all learned the skill of multi-tasking. Peer to Peer travel products such as AirBnb, Uber et al. While I personally find these services to be illegal or unreliable – the other factors make these attractive. I think its important to recognize that when we are looking at the long view – be careful with short term data trends.